Cap Plates - Portland Stone Ware Co., Inc. Choosing a cap plate is easy, but important. 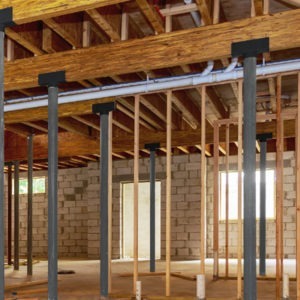 The IRC (International Residential Code) states under R502.9 Fastening (Floors) “…Where posts and beams or girder construction is used to support floor framing, positive connections shall be provided to ensure against uplift and lateral displacement.” There are a few ways to get positive connection from beam and column that support floors. 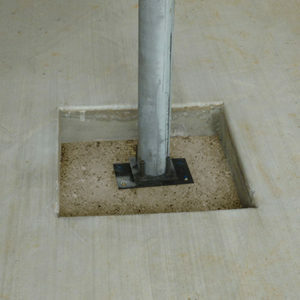 Note that all column top plates have to be attached to beams using the appropriate screws or bolts. The traditional way of welding a plate to the column in the field can be time consuming and costly. 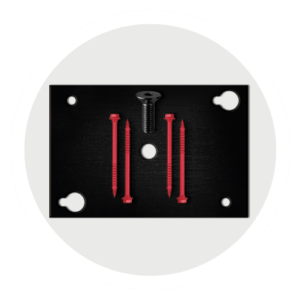 Or with the Lally Lock Column and Lally Lock Plates the plate simply screws into the embedded fastening unit on one end of the column. 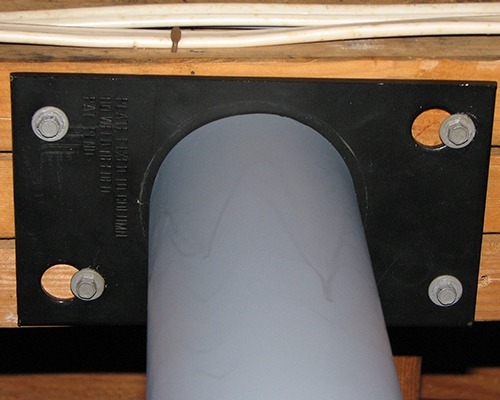 Then the plate is fastened to the beam creating the required connection between the column and beam. 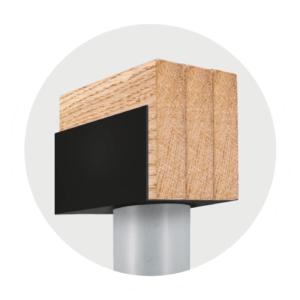 Whether you are looking for a standard plate or a plate to saddle a beam, we have a size a to meet any beam configuration. This plate is made in low carbon steel in dimensions 5 3/8” x 5 3/8” x 1/8”. The plate has two 5/16” holes, two ¼” slotted holes, four 3/8” oval holes, and four raised lugs to fit outside dimension of the column. One 9/16” counter sink hole is center located to attach the column. One ½” hex head screw is included in the packaging (5/16” hex head bit not included). 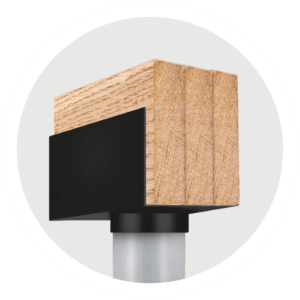 The Lally Lock Beam Plate is a great option for wider beams. It is 8” long and made from ¼” low carbon steel. 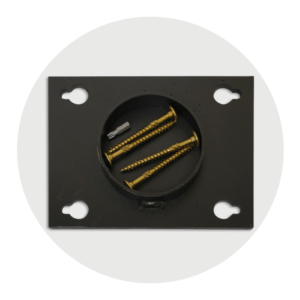 The plate has either one keyhole or one 3/8” hole located in each corner and the plates are packaged with GRK screws. 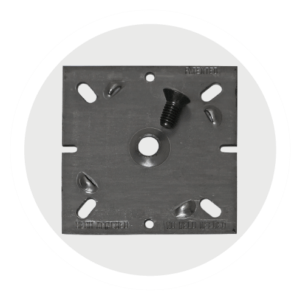 To accommodate any Lally Lock Column diameter, this plate has a 19/32” counter sunk hole in the center of the plate to accept a ½” bolt. This plate is offered in the following widths for different beams: 3 1/8” for 2 2x’s, 3 5/8” for 2 LVL, 4 5/8” for 3 2x’s, 5 3/8” for 3 LVL, 6 1/8” for 4 2x’s, and 7 1/8” for 4 LVL. This plate is made from 12-gauge low carbon steel to wrap the sides of a beam. Eight 3/16” holes are cut out of each side of the saddle for bolting the saddle to the beam. Located in the center of the bottom of the saddle is a specially designed hole for a bolt to connect the plate to the column. It comes in different size saddles to fit different beams. The sizes are as follows: 3 1/8” x 11 ½” for 2 2x’s, 3 5/8” x 11 ½” for 2 LVL, 4 5/8” x 11 1/2” for 3 2x’s, 5 3/8” x 11 ½” for 3 LVL, 6 1/8” x 11 ½” for 4 2x’s, and 7 1/8” x 11 ½” for 4 LVL. The Standard Plate is 5”x5” with small tabs for the top or base of columns. The steel is 10 Gauge. Similar to the Springfield plate. 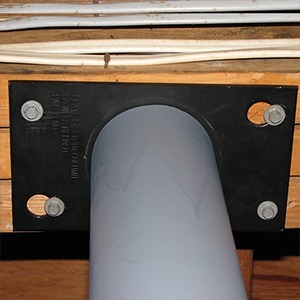 This plate has a welded ring that encompasses the top or base of a 3 ½” or 4” column. It is also similar to the lally lock beam plate as it has the same hole configurations. However, this plate has to be welded to the column. 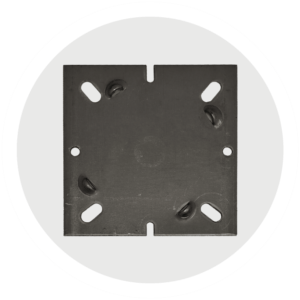 It comes in different size plates to fit different beams: 3 1/8” x 8” x ¼” for 2 2x’s, 3 5/8” x 8” x ¼” for 2 LVL, 4 5/8” x 8” x ¼” for 3 2x’s, 5 3/8” x 8” x ¼” for 3 LVL, 6 1/8” x 8” x ¼” for 4 2x’s, and 7 1/8” x 8” x ¼” for 4 LVL. These plates are packaged with GRK screws. This plate is made from 12-gauge low carbon steel to wrap the sides of a beam. Eight 3/16” holes are made into the sides of the saddle for the saddles to be bolted into the beam. A ring made for 3 ½” or 4” columns is welded to the bottom of the saddle. It comes in different size saddles to fit different beams. The sizes are as follows: 3 1/8” x 11 ½” for 2 2x’s, 3 5/8” x 11 ½” for 2 LVL, 4 5/8” x 11 1/2” for 3 2x’s, 5 3/8” x 11 ½” for 3 LVL, 6 1/8” x 11 ½” for 4 2x’s, and 7 1/8” x 11 ½” for 4 LVL. 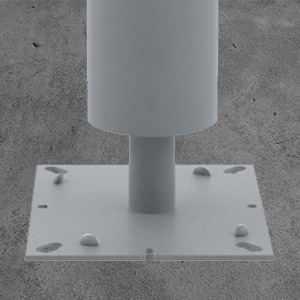 Originally, our patented Lock System was designed for our concrete filled and hollow adjustable lally columns. 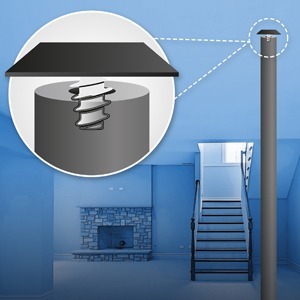 Our patented Lally Lock columns are concrete-filled and are available in 3 1/2″ or 4″ outside diameter. Our system allows users to simply screw in any of our cap plates into a 6″ threaded rod. Our base plates are designed to disperse a wide range of load configurations. 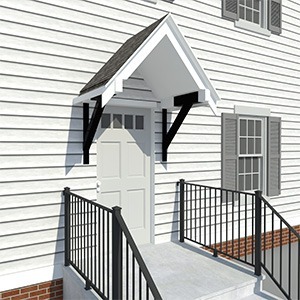 Our columns come 3″ & 4″ in diameter and are constructed using 11 gauge steel. Use our bracing when building a deck in high wind areas, reinforcing an existing deck, or looking to distribute weight.